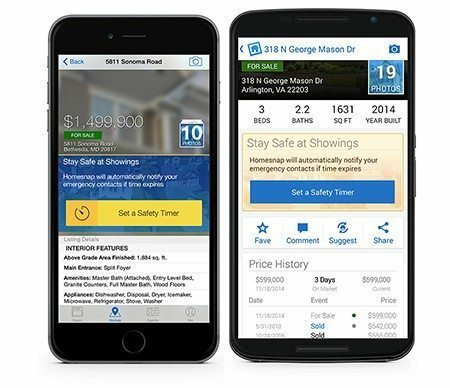 When it came to developing a tool to boost agent safety, mobile real estate software company Homesnap had two challenges. First, it had to overcome complacency by creating something agents would use even if they were unlikely to encounter a dangerous situation. Then, it had to find a way to keep agent’s co-workers or loved ones from “tuning out,” as they might be prone to do if they were constantly receiving messages telling them that the agent was OK.
To tackle the first challenge, Homesnap built safety features into the app it had already created for agents, Homesnap Pro. Agents already use Homesnap Pro when they’re going to conduct showings, said Homesnap co-founder and CEO Guy Wolcott. If the features were in a separate app, agents probably wouldn’t use it or forget to use it and say, “I’ll use it next time,” Wolcott said. Homesnap Pro is currently available to 80,000 agents nationwide in MLS markets offering the app, including Rockville, Maryland-based Metropolitan Regional Information Systems Inc. (MRIS), Silicon Valley-based MLSListings Inc., Southern California-based Combined Los Angeles Westside MLS Inc. (also known as The MLS or CLAW), and the Greater El Paso Association of Realtors. This past summer, Homesnap began offering the app to MLSs free for the first year. The safety features are available at no charge to all Homesnap Pro registered agent users, which currently number almost 20,000, the company said. After the kidnapping and killing of Arkansas real estate agent Beverly Carter, Homesnap saw the need to provide agents, brokers and MLSs with an effective, simple tool that helps address situations where agents’ safety may be at risk, the company said. While some have called for MLSs and associations to institute “rules of engagement” for dealing with prospective clients in the wake of Carter’s death, efforts have focused mainly on education. 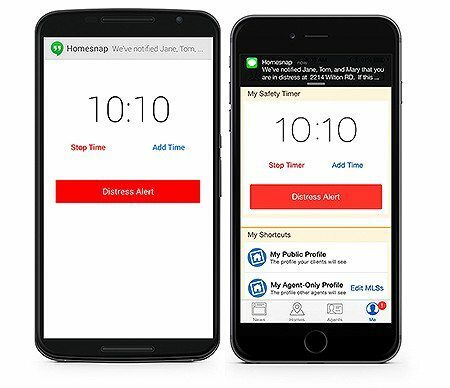 Homesnap Pro’s new features include a “Safety Timer” in which agents enter the address of the the property they’re showing, how long they expect to be there, set a timer for however long they like, and choose emergency contacts from their phone’s contacts list. Agents have to enter their emergency contacts only once and can choose as many as they like. While a timer is going, agents can leave the app and do anything else on their phone, Wolcott said. The app warns agents when time is running out and allows them to either stop the timer or extend it. If an agent does neither and the timer runs out, emergency contacts receive a text message letting them know that the agent “may need assistance” and giving the property address the agent entered into the app and the agent’s phone number, as well as instructions to call the agent or to call 911 in an emergency. The text message notes that it is an automated message from Homesnap. Homesnap expects that agents will talk to their emergency contacts beforehand and let them know the drill, Wolcott said. Recipients need only to be able to receive text messages — smartphones are not necessary, he added. The company also incorporated a “Distress Alert” into the app that agents can push at any time to send a more forceful notice. The message lets contacts know that the agent is “in distress” and that the message was triggered by the agent, in addition to the property address and phone number. Agents have three seconds to cancel a distress alert, Wolcott said. Because emergency contacts receive messages only when something has apparently gone wrong, the company hopes that will mitigate the risk of emergency contacts tuning out, he said. One thing to keep in mind is that the messages sent by the app do not send the agent’s current location as determined by GPS. Rather, the app sends the property address indicated by the agent as the home he or she planned on visiting. “You could have walked around the corner in the last five minutes, but it’s pretty contemporaneous,” Wolcott said. 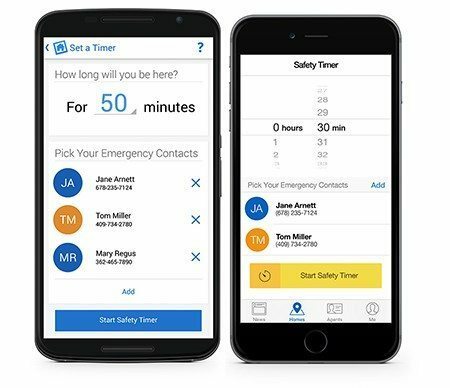 In addition, setting the safety timer is probably not something that an agent wants to do right in front of a prospective client, but rather when the agent is prepping for the meeting beforehand in another location, he said. If an agent decides to visit another home during a showing, he or she can wipe out the old timer and set another one, Wolcott said. Whether the home is for sale or not, Homesnap Pro will have information about the home that the agent would want to look up anyway before going there, he added. The company is also currently looking at ways agents could use the safety features in the future that don’t require them to take their phone out, Wolcott said. Now that Homesnap has integrated the ability to create comparative market analyses (CMAs), schedule showings, and, now, safety features, into Homesnap Pro, the company is excited about integrating other uses into the app, Wolcott said, though he declined to elaborate on the company’s future endeavors.